High Quality Content by WIKIPEDIA articles! Vladimir Davidovich Baranoff-Rossine (Russian: - ) (1888 1944) was a Russian-Ukrainian painter, avant-garde artist (Cubo-Futurism), and inventor of Jewish ethnicity. 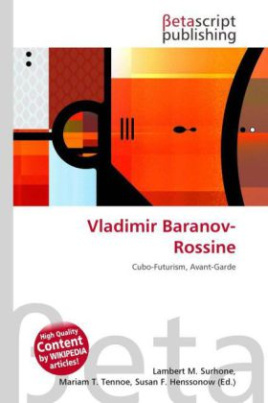 Vladimir Baranov-Rossine was born in Kherson, Ukraine, to parents of Jewish ethnicity. In 1902 he studied at the School of the Society for the Furthering of the Arts in St. Petersburg. From 1903 to 1907 he attended the Imperial Academy of Arts in St. Petersburg. In 1908 he exhibited with the group Zveno ("The Link") in Kiev organized by the artist David Burliuk and his brother Wladimir Burliuk. In 1910 he moved to Paris, wher until 1914 he was a resident in the artist's colony La Ruche together with Alexander Archipenko, Sonia Delaunay-Terk, Nathan Altman and others. He exhibited regularly in Paris after 1911.